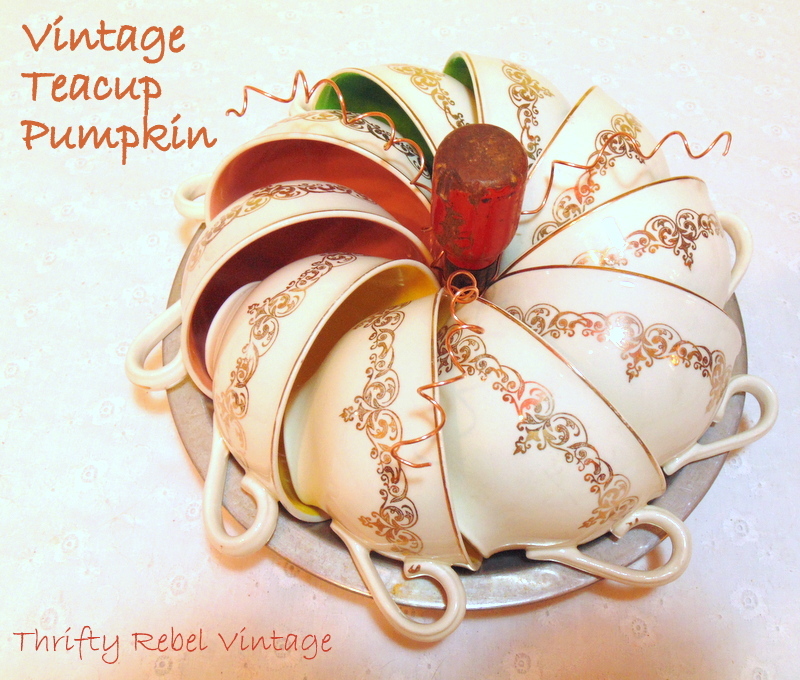 I have a thing for making pumpkins, and this repurposed teacup pumpkin was so quick and easy to put together. 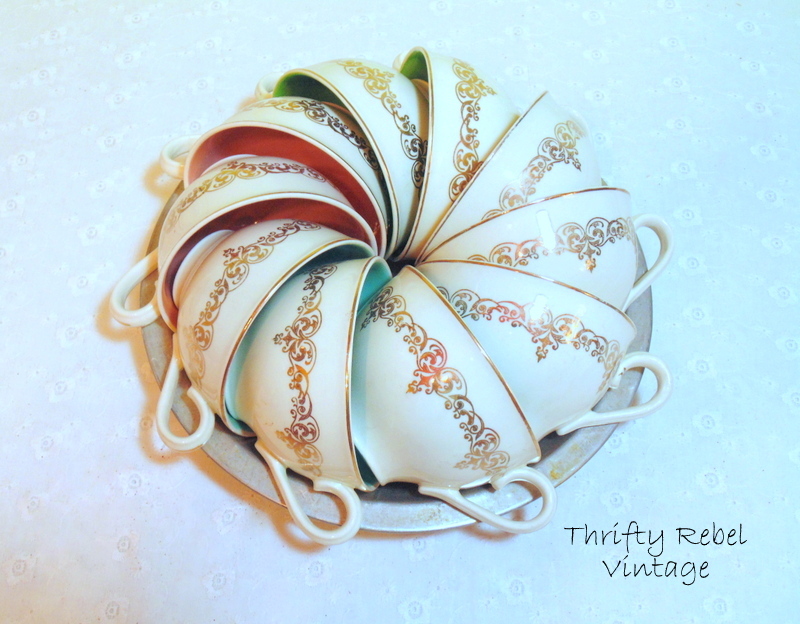 I love me an easy repurposed teacup project. 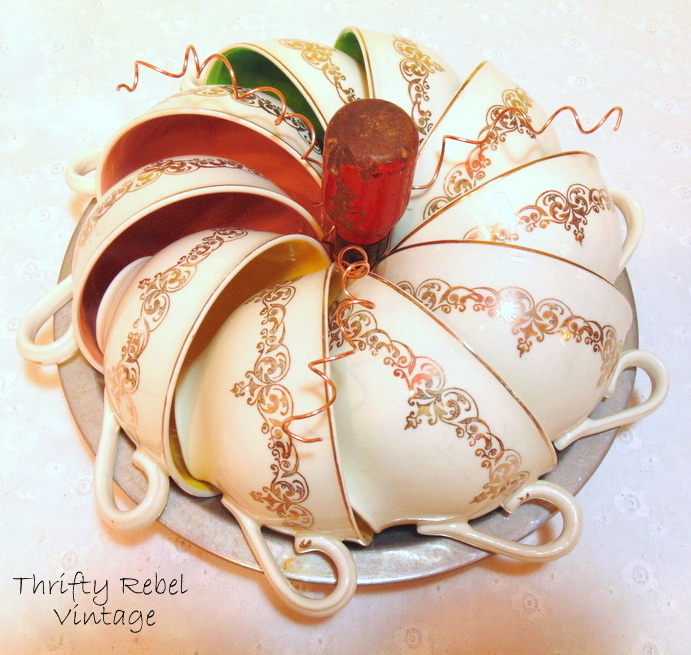 When looking through my stashes I found these vintage teacups left over from my teacup lampshade project, and I thought they’d make a perfect quickie pumpkin. I grabbed a vintage baking pan from my stash and placed the teacups around the inside. I could have painted the pan ivory or copper, but this project was meant to be more organic than that…. just grabbing things the way they are and putting them together to make something. That’s when repurposing is the most fun for me. So quick and easy peasy. The inside colours you see change depending on the viewpoint if the colours are kept together. 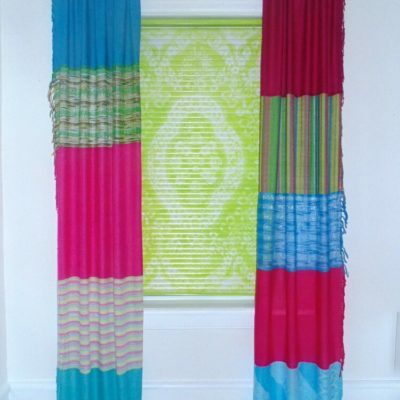 Or the inside colours can be mixed like above. For the stem I used a small vintage screwdriver from my collection. This little guy didn’t get used in my vintage screwdriver sunburst clock project because he was too small, but he’s perfect for this. 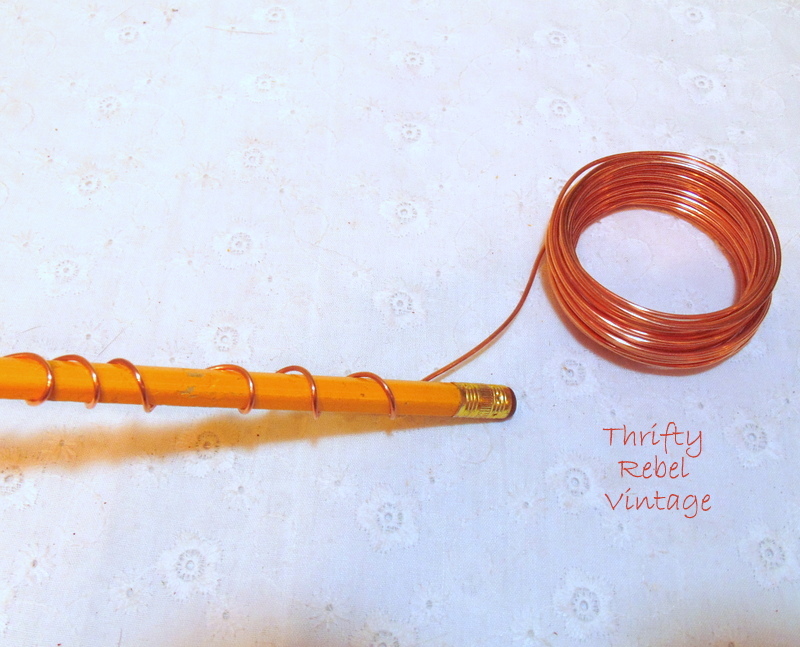 and wrapping the ends around my vintage screwdriver. I think it just gives it that little extra finishing touch that it needed. This repurposed teacup pumpkin was such a fun and easy project, and it only took about 10 minutes… not counting looking through my stashes. It kinda looks like a pumpkin… doesn’t it? Feel free to humour me. lol. If you enjoyed this teacup pumpkin, you might also enjoy my repurposed shower curtain ring pumpkins. I had to run right over to see how you took tea cups and created a pumpkin. You did, you did! Pinning and sharing. Vick’s Vapor-Rub and and a hot towel on the chest – old, but effective. Thanks Donna! I thought maybe the fog of my cold was getting the better of me. Thanks for the old remedy too. I’m starting to feel better. Even sick, you are so creative! How cute this is and easy to re-do next year. Love the teacups. I have never seen any like those. Thanks AnnMarie! 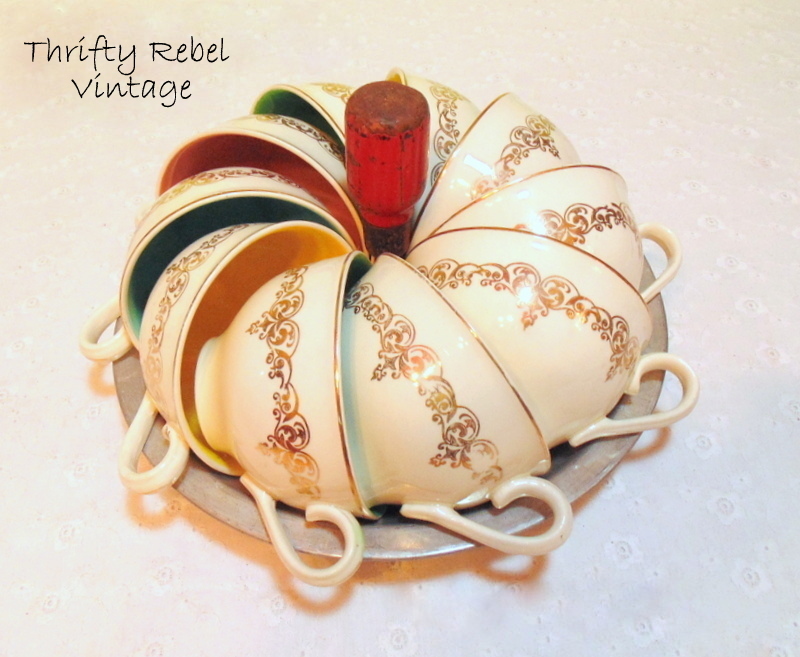 It’s so easy to take apart and do again, or repurpose the teacups into something else. 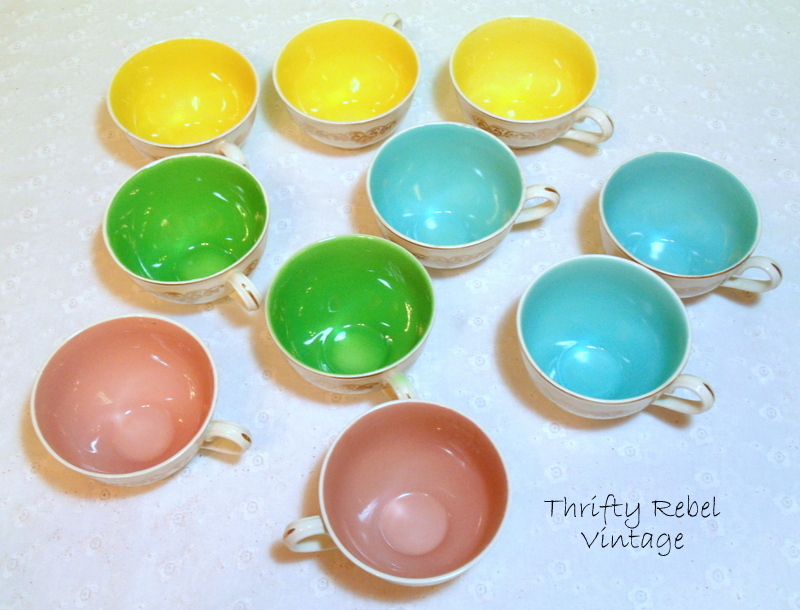 I was lucky to find a whole box of these teacups and their saucers a couple of years ago, 34 sets in total. It was quite the score for $2. awwwwww, the colored insides are so pretty with this project. beautiful! Thanks Audra! I’ve never seen teacups like this since of before I found these. The colours are very pretty. That is very clever. Definitely a pumpkin and I have to say the screwdriver is the cherry on top! Way to go. Thanks Karen! 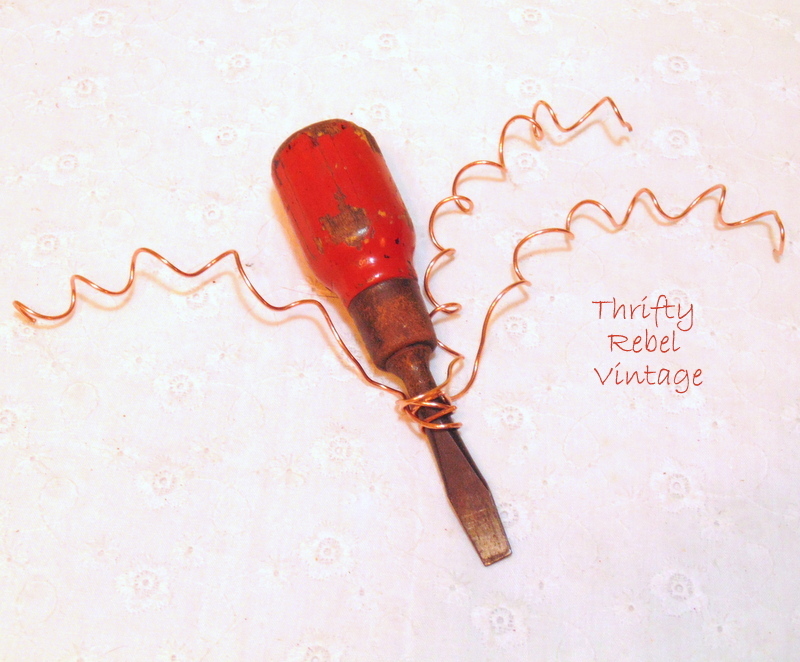 I love my vintage screwdrivers and it is fun to use them in projects. Another clever Tuula creation! I might try this as soon as I figure out where all my holiday teacups are stashed. Thanks so much Tina! I hope you find your holiday teacups. Now I want to make pumpkins with all my teacups. lol. OMGee, that is so brilliant and adorable!!! Well I’ll be…. it does look like a pumpkin! I would have never thought to put the cups together like that and stick a screwdriver in the middle…. were you still taking cold medicine when you did this LOL? Seriously, it looks very cute and you always amaze me with your talent! Glad you’re feeling better my friend! Thanks Sherry! I think the medication definitely had something to do with it. lol. That is just the cutest thing……..what a clever idea, I definitely think it looks like a pumpkin. and you can dismantle it and use it for something else or on the table like always. Thanks Nellie! Yes, and the teacups are still OK to use as… well… teacups. lol. How cute, quick and clever of you. Love the addition of the curly wire. I hope you’re feeling better now. Thanks for sharing your pumpkin creation at Vintage Inspiration Party. Thanks Betsy! I thought it looked a little naked and needed a little something. I love copper wire. Wow! Thanks you so much Lynn! What a great compliment Mimi! Thanks so much, and thanks for the invite to the party. Thanks so much Kathleen! They are really pretty teacups. I was lucky to find them. The colours inside are quite amazing. Thanks Cecilia! 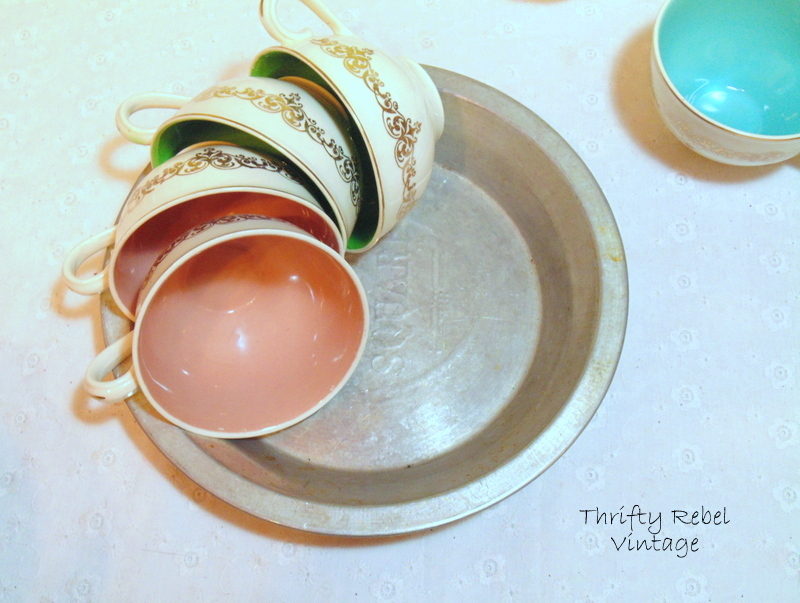 I’m a repurposing fanatic too, and there’s more I love to use than vintage teacups. They’re just so pretty. That’s so wonderful Cecilia. I’m so thrilled to be featured! 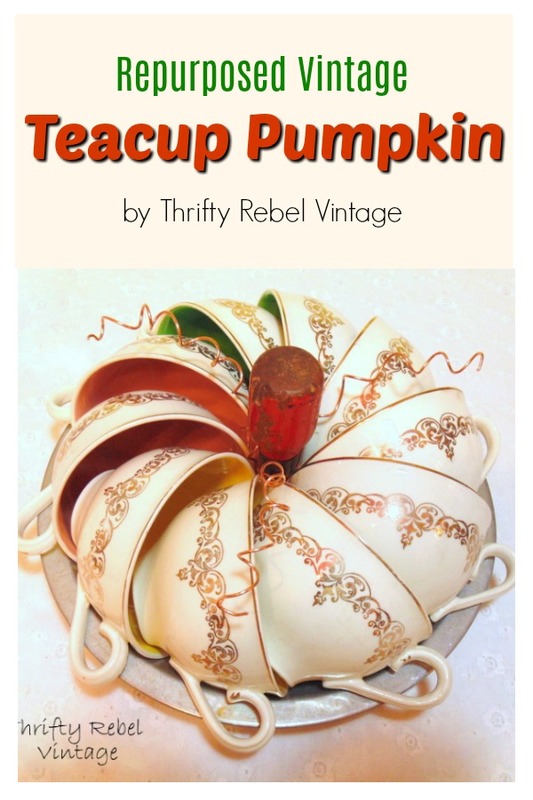 Tuula, Congratulations ~ your Vintage Teacup Pumpkin was chosen as our Feature of the Month! We’ll be posting about it tomorrow so stop by and pick up your special button. Wow Cecilia! That’s so fabulous! Thank you so much! Tuula, your creative mind amazes me! This is so darn cute. 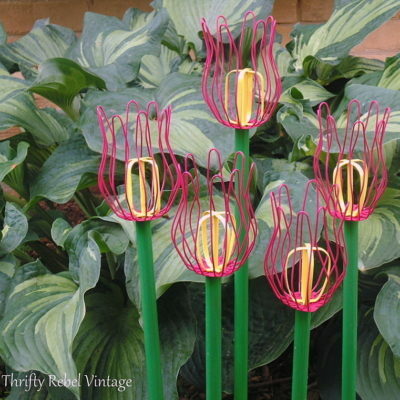 Love the color inside the cups and yes, the copper curly cues are a fun addition! Thanks for sharing with SYC. Thanks so much Jann! It’s always a pleasure to join the party. That’s briliant! I’ve never seen teacups used that way. What a cute idea!! So creative! Thanks for sharing at Home Sweet Home! What a darling décor idea, especially for a tea-lover! Super cute idea! Visiting you from Ivy and Elephants. Really cute, Tuula! I saw your feature on Ivy & Elephants, but I also saw it on another blog or FB page (Hometalk?). Regardless, congrats, as it’s well-deserved for the ingenuity, the choice of materials (those cups are just the perfect coloring), and the display. Really, really, really cute! I like the way you think. Just when I thought I’d seen every possible way to make a pumpkin! This is the most unique one I’ve seen yet. Love it. Pinning. Thanks Virginia, for stopping by and for pinning. 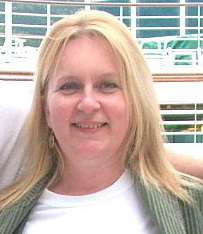 Hi Tuula, just hopping by to let you know that I will be featuring you at SYC. Love your creativeness! Thank you so much Jann! What a wonderful treat! Your tea cup pumpkin is just adorable. I love how creative you are. Congrats on all of your features for this. Wishing you a nice week and Happy Halloween. Thanks Julie! I hope you had a Happy Halloween too. Most certainly looks like a pumpkin -one to be displayed for all the fall season! Love it. Am I correct in thinking you have glued nothing together? By placing it in the pan, it is held together and you could always disassemble it and reuse everything? Thanks Barbara, and you are correct. The teacups fit so nicely into the baking pan that they formed the pumpkin ring without the need for any glue. I love repurposing in ways that can be changed later when I just feel like I want something different. What a cute idea! Your pumpkin would look so cute on the Thanksgiving table or on a buffet or sideboard. As my daughter used to say, “You are BIG smart!” What a unique and clever idea! I am a teacup collector and own a metal pie pan, stumpy screwdriver and wire. I just think I will take that idea and run with it! Thank you for the best pumpkin idea yet! Wow Gabi! I love that saying, and thanks so much! Your version is lovely Laura. I’m so glad that my project inspired you. Thanks so much for letting me know. You made my day! Tuula, how did I miss this?! Absolutely adorable. Congrats on being featured at The Vintage Charm #3 party. I think this is brilliant (didn’t realize it was teacups at first!). I Love this! 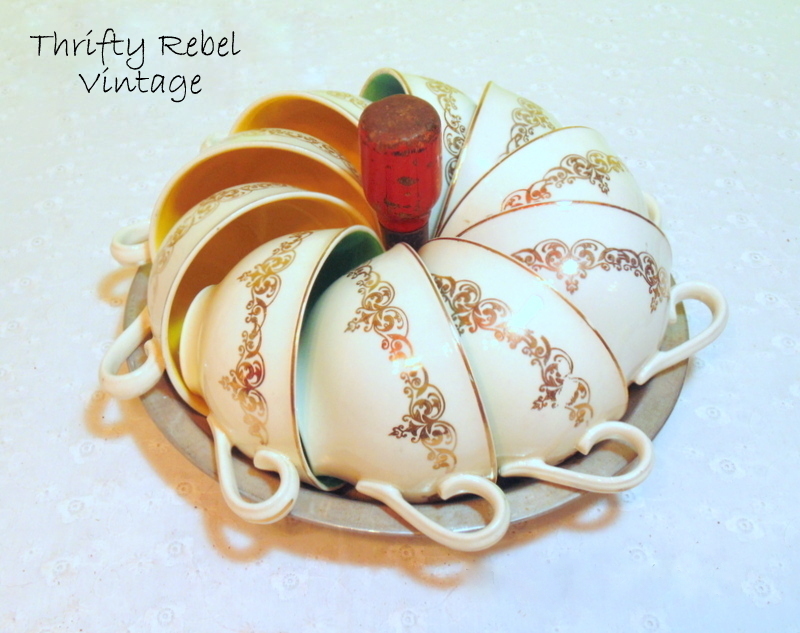 I saw this posting a few wks ago on My Thrift Store Addiction and was at my mothers last night – she has a Noritake Lusterware orange banded tea service that I thought of instantly when I saw this post. I checked it out last night and they are so perfect for this! She has the teapot and creamer/sugar with dessert plates so we will be able to make a whole tablescape around your wonderful idea – thanks for the inspiration! Just saw this blast from the past on your blog and love it! It definitely looks like a pumpkin to me. I’ll be on the lookout for some teacups I can use to copy this idea.